TAMPA, Fla. (AP) - Maybe his shooting touch was a little off, and his legs grew weary after being injured so long. No matter, Sidney Crosby looked as though he had never been away. Just as importantly for the Pittsburgh Penguins, so did goalie Marc-Andre Fleury. Crosby missed scoring chance after scoring chance before finally setting up Maxime Talbot for the game's first goal with only 2:47 remaining. The Pittsburgh star made a dazzling return in his first game in 6 1/2 weeks, leading the Penguins' 2-0 victory over the Tampa Bay Lightning on Tuesday night. Fleury, in only his second start following his own extended injury layoff with a bad ankle, turned aside 35 shots in his first shutout since Nov. 24 and third of the season. Evgeni Malkin, edging to within a point of the NHL scoring lead, scored into an empty net with 5 seconds remaining. But it was Crosby's night. The reigning NHL scoring champion and MVP appeared as if he had been off only a few days rather than since Jan. 18 with a high ankle sprain. He created numerous scoring opportunities with his speed and stickhandling as the Penguins retained their Atlantic Division lead and took over the Eastern Conference lead with about a month remaining in the regular season. "It's good to get it over with and get that feel and get that timing back, but it's still not there," Crosby said. "I had some great chances that I would have loved to put in. It didn't happen. Sometimes that's the way it goes. I'm a little rusty." He didn't look it. Afterward, among those waiting outside the Penguins locker room to greet Crosby was the Yankees' Johnny Damon, who received an autographed stick. Of course, it doesn't take a star center fielder to recognize how good a center Crosby is. "Who's not a fan of Sid?" Damon said. "Seeing that kid play is amazing." Ask the Lightning, who are 13-2 in their last 15 against the Penguins but went 0-2 against them at home this season. "He's pretty special," defenseman Shane O'Brien said. "We kept him off the boards for 58 minutes or whatever, but he's a great player." "I just got a drop pass and drove the net. I tried to put it through and he (Talbot) did a great job of battling there," Crosby said. Mike Smith couldn't make the save, perhaps his only mistake on a night when many of his 22 saves were difficult - including a stop of Petr Sykora's penalty shot in the second period. Despite Smith's play, the last-place Lightning are 1-6-1 in their last eight. "I kind of slipped out (of the net). I should have been there," Smith said. "It's frustrating to have zero on the board the whole game and then lose it like that." Fleury was even better while winning his sixth in a row during a streak that began before he also injured his right ankle Dec. 6. He didn't start again until beating Atlanta 3-2 in a shootout Sunday, but has stopped 66 of 68 shots in his two post-injury starts. Fleury's best save probably came on Vincent Lecavalier's breakaway off Martin St. Louis' pass with 8 1/2 minutes remaining. "He (Fleury) was the story of the game," Penguins coach Michel Therrien said. Crosby wasn't expected to play until perhaps Sunday in Washington - it was a surprise when he declared himself ready to go after the pregame skate. But No. 87 took his first shift less than a minute in and didn't take long to get his first good scoring opportunity. He took Talbot's excellent cross-ice pass near the edge of the left circle and barely missed an open net after being on the ice for perhaps 20 seconds. 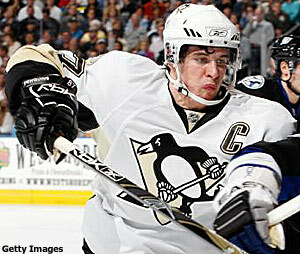 Crosby, who coincidentally was injured against Tampa Bay, had an even better chance late in the period. He came off the bench and immediately got loose on a breakaway, kicking the puck to his skate while beating defensemen Paul Ranger and Alexandre Picard. But Smith closed his pads to make the save. Crosby had two more good chances, one on a short breakaway, early in the second period. Despite all the misses, Crosby was as fast, fluid and creative as ever. "He's the best player in the league," Fleury said. "Having him on our side is always a big help." Notes: Crosby was the league's leading scorer with 63 points in 46 games before getting hurt. ... Penguins F Jordan Staal left with bruised ribs in the first period and didn't return. ... Still out for the Penguins is two-time All-Star forward Marian Hossa, who hurt a knee Thursday in Boston during his first game with them and isn't ready to return.